Zsa-Zsa Rensch is a San Francisco Bay Area based creative marketer and project manager, working under the moniker of Zsa Zsa, Inc. As a champion for music and the arts she has found a way to connect the dots. 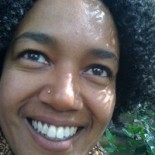 Current projects include content curation and buzz building for Fusicology.com (Bay Area) and advisory board duties for the Oakland Film Society. She has build the buzz for Bay Area genre-defying music acts, and loves attending live music concerts and tech conferences. She documents her take on Bay Area counter-culture at her blog, The Z List, which is broadcast live as an audio guide every month on Hard Knock Radio.